Boston Post Dairy is located on the Gervais Family Farm, a family run farm in northern Vermont owned and operated by Robert and Gisele Gervais and 12 of their 15 children. The Gervais family have been farming the property since 1962 when they began with 35 Jersey cows and 220 acres of land. Today they milk over 1,800 cows and grow 3,100 acres of corn and hay. In 2013, their farm was given the prestigious Vermont Dairy Farm of the Year award that annually honors an outstanding, efficiently managed dairy enterprise that sets a strong example for other farmers to follow. Farms are evaluated on a number of criteria including production records; herd, pasture, and crop management; environmental practices; contributions to agriculture, the local community and excellence in dairying. Boston Post Dairy is operated by the 4 Gervais daughters and named after the old road that runs through the property. The Dairy is home to 70 dairy goats and 80 dairy cows. They make cheeses from goat milk, cow milk, and a blend of goat and cow milk as well. Bon Père is the perfect cheese for June – think Father’s Day – because it is named after Robert Gervais, father of the 15 Gervais children. It is a 20% goat and 80% cow mixed milk cheese that is aged for 3 to 5 months in a red paracoat rind. 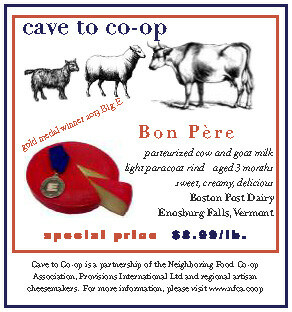 Bon Père won a Gold Medal at the 2013 Big E New England Regional Cheese Competition. It is sweet, creamy and delicious with a flavor that intensifies as it ages. A great cheese for cooking, for children and for everyday munching, Boston Post suggests pairing Bon Père with pale ale, smoky beer or sweet berries. Here are a few recipes that really make it shine. Pre-heat oven to 425°. Remove outer skin from garlic but keep it whole. Cut off the top, brush with olive oil and wrap in foil. Bake for 30 minutes or until soft. When cool enough to handle, squeeze the softened garlic into a food processor, add the crème fraîche and cilatro. Process until blended and remove to small serving bowl. Boil or steam the potatoes until just tender. Cool, Cook the bacon in a heavy skillet over medium heat until cooked but not crispy. Drain on paper towels. Lower the oven temperature to 375°. Cut the potatoes in half lengthwise and place a tablespoon of Bon Père on each cut side. Wrap with a strip of bacon and secure with a toothpick. Place the potatoes on a baking sheet, grind some pepper on each and bake for 10-15 minutes or until bacon is crisp and cheese has melted. Serve hot with the garlic sauce. Heat a heavy frying pan over medium low heat. Spread half the butter on one side of each slice of bread. When the pan is warm, add one slice of bread, butter side down. Top with half the cheese, the slices of fruit, and then the rest of the cheese. Top with the second slice of bread, buttered side up. Cook until the bread is toasted and golden on both sides. Cool briefly, slice and enjoy. Great with a pale ale! Cook the pasta according to package directions, then drain, reserving a cup of the pasta cooking water. While the pasta is cooking, put the peeled and seeded avocado, the garlic and the lemon juice in a food processor and process until smooth. Add the milk and process again. Add the basil, the cheese and a good pinch of salt and some freshly ground pepper to taste. Process until very creamy and homogenous. When the pasta is done, place it in a large serving bowl, add the sauce, toasted pine nuts and some of the reserved pasta water to thin the sauce a bit. Garnish with more basil and a bit of crushed red pepper. Serve immediately. Two hours before serving, combine the marinade ingredients in a shallow dish and add the mushrooms, tops down. Spoon some of the marinade into the inside hollows and let them soak for two hours. One hour before serving, pre-heat the oven top 425°. Slice off the top of the heads of garlic, brush with olive oil, wrap in foil and bake for 30 minutes until soft. Let cool. Bring the ½ cup of balsamic to a boil in a small saucepan. Reduce to a simmer and cook for 3 minutes, turn off the heat and set aside. Slice the red onion and cook with ½ tablespoon of olive oil in a sauté pan over medium heat, stirring occasionally, until soft and caramelized, about 10 minutes. Set the onions aside but leave the pan on the heat. Remove the mushrooms from the marinade and add to the skillet, cap side down. Cook for 5 minutes, then flip and cook for 5 more, then turn back over and add a slice of Bon Père, cover the pan and cook over low heat until the cheese melts. Toast the rolls. Squeeze the roasted garlic into a small bowl and mash with a fork. Spread on both sides of the toasted rolls. Top the rolls with a mushroom cap, caramelized onions, tomato slice, avocado and lettuce. Drizzle with the balsamic reduction and serve. Cut the fruit in half, and use a melon baller or a spoon to scoop out the core. Brush the cut surfaces of the fruit with olive oil. Sprinkle with the cardamom and a few grinds of pepper. Put the fruit halves in a small baking dish, rounded side down. You can cut a tiny slice off the rounded side to help the halves stay upright. Bake for about 10-15 minutes. Remove from oven; place the slices of Bon Père over the center of the fruit. Bake another ten minutes, or until the cheese melts nicely. Remove and serve, with a garnish of watercress, a sprinkle of great sea salt and another drizzle of olive oil.